We’re members of Harrogate and Knaresborough Toy Library. It’s a service that allows you to borrow from a huge selection of toys – not tatty rubbish either – good quality new toys – then take them back to swap for other toys a couple of weeks later, or renew the loan. Today’s loan for Annie is the sit in activity centre, she’s pictured in above. She was mesmerised when we popped her in just now as you can see from my snap. Intensely fascinated with the new world around her – all of a sudden, with its buttons, flashing lights, smiley faces and noises and dangly things. The Rainforest Jumparoo, would have cost us around £100+ to buy. We get to stimulate, fascinate and educate our kids with fresh toys ‘all the time’. We save loads of money from not having to buy the toys. When kids get bored of toys after a few days or weeks (as is often the case) we can pixie them away and swap them for new toys instead of having loads of unused toys cluttering up our house. We can have toys that are perfectly applicable for the various age groups of our children. Big toys take up a lot of space. We can take them back if they’re getting in the way. We’re being a bit green and groovy for the environment – less landfill, less plastic consumption, smaller carbon footprint. We get to use toys that we wouldn’t choose to buy, due to price or other reasons. We’re confident that all the toys are cleaned and checked regularly. 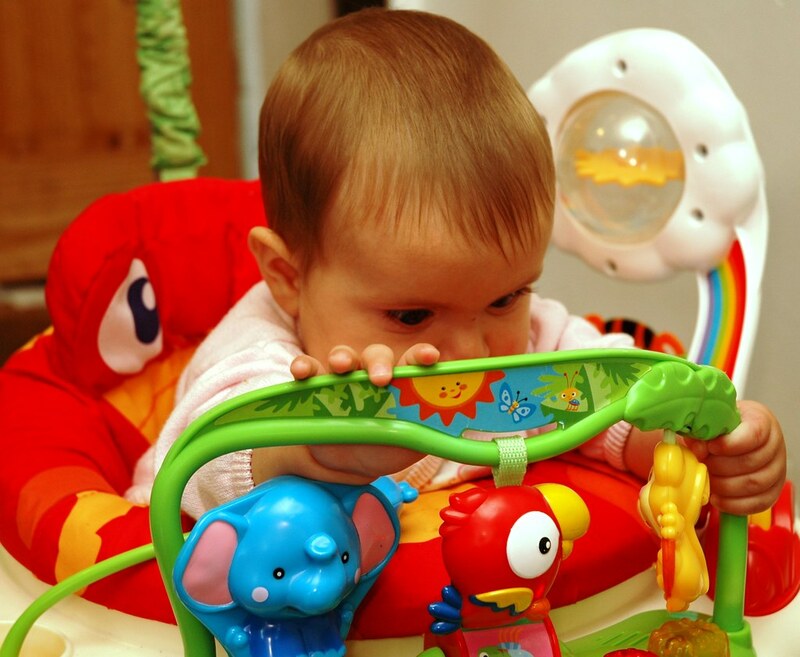 Things other than toys are available – bouncy chairs, baby baths, bumbo baby seats and play gyms are handy as babies tend to grow, that sort of equipment doesn’t! Seasonal toys – thing for outside can be borrowed just for the summer months. As well as the lending side, there’s a strong community side to the service as well. A popular and fun Stay and Play session happens quite frequently, with outdoor sessions during the summer. They also have specialist toys for special needs and party equipment – ideal for entertaining groups of kids. Some of the more specialist lines include multi-lingual books and heuristic play resources. It’s run as a not for profit charity and the vast majority of membership subs and donation goes into buying new toys and equipment. They offer a family membership, which means people like me with 4 kids get superb value for money, never the less, it still represents a huge cost benefit for people with just one, or even no kids – as people like grandparents – who’ve got kids coming to stay every now and then use the service, so they can borrow a few toys when the grand-kids come to visit and give them back, when they go home. Stuck for what to give this Christmas? (yes yes, I know it’s still over quarter of a year away, but they have got the mince pies out in the co-op) My tip-o-the-day would be that a Toy Library family membership is a great gift that keeps on giving, all year round! More info on the Harrogate and Knaresborough Toy Library can be found by visiting their website : hktl.org .